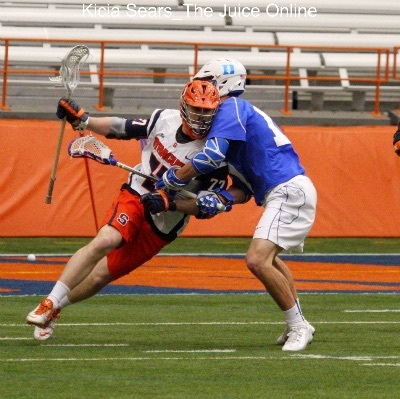 The Syracuse men’s lacrosse team exorcised some major demons on Sunday against Duke in the Carrier Dome. The Orange (7-0) were superb from start to finish in every facet of the 19-7 trouncing. It must have felt good to return the favor to the Blue Devils. It was one year ago this week when the Orange took a 21-7 beatdown in Durham. In that game—the team’s most lopsided defeat in more than 30 years and its last regular season loss—Duke scored 10 goals in a row in the first half. The Blue Devils’ faceoff specialist Brendan Fowler helped the team win 24 of 31 draws. It’s not the only time of late Syracuse has had trouble dealing with the Devils. The Orange has been looking up at two-time defending national champion since 2012. Before Sunday, Duke won four of the past five matchups, including the 2013 title game; Fowler’s dominance at the X (winning 20 of 28 draws) proved to be the deciding factor in that game as well. In fact, over that five game stretch, Duke outscored the Orange 76-52 and won 93 of 142 faceoffs (65 percent). The Orange’s only win over Duke since 2012 was last season in the ACC tournament semifinal, where it needed a furious rally to best the Blue Devils 16-15. The story was much different on Sunday. After Duke won the opening faceoff and turned over the ball, Syracuse scored four straight goals before the Blue Devils even had another possession. The Orange jumped out to a 6-1 lead after the first quarter and 13-1 lead at the half. Attackmen Kevin Rice and Dylan Donahue finished with seven points apiece while midfielder Henry Schoonmaker netted three goals. The offense didn’t miss a beat as Randy Staats missed the game with a lower-body injury. The key, of course, was the X. Ben Williams won 13 of 16 draws in the first half and 14 of 22 in the game. But the Syracuse defense was up to the task too. It held a Duke attack that entered the game third nationally in scoring offense (16 goals per game) to just two through the first three quarters. Bobby Wardwell made 11 saves before being replaced in the fourth quarter. 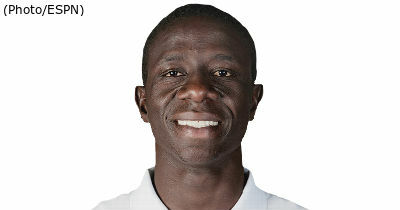 Close defender Brandon Mullins limited Duke leading goal-scorer Justin Guterding to two goals while Peter Macartney and Scott Firmin held Duke star midfielder Myles Jones scoreless. Jones dished out just one assist; he averaged 5.63 points per game before Sunday. Since 2008, Duke and Syracuse have dominated college lacrosse. The teams have combined to win five of the past seven national titles and rank first and second for the most wins and highest winning percentage during that span. But Duke seems to have pulled ahead as king of the sport since 2012. That’s why Sunday’s win was so important—and the biggest step yet as Syracuse strives for its first title since 2009. 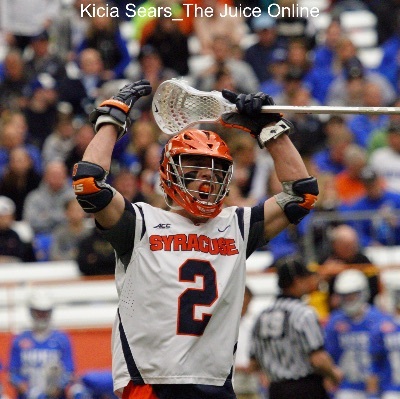 Syracuse puts its unbeaten record on the line when they visit Notre Dame on Saturday at noon.